After almost 15 years, the 60th Annual Grammy Awards returned to New York City last night to deliver one of the biggest and best musical events audiences have seen. While the Grammy Awards also doubled as a stage for the recent #MeToo and #TimesUp movement, it remained like any high-profile, beloved ceremony, full of incredible performances and equally as memorable and surprising moments both during and prior to the awards broadcast. Of course, there were some moments and awards that didn’t exactly surprise as much as the response to them, but one thing is for certain: the Grammy Awards are never dull. With late night talk show host, James Corden at the helm of the event, we look back at five of the best and most powerful moments from this year’s Grammy Awards. One of the most powerful and moving performances of the night came from singer and songwriter, Kesha, who gave an emotional performance of her single “Praying” surrounded by other incredible female artists, including the likes of Cyndi Lauper, Bebe Rexha and the Resistance Revival Chorus. Many lauded the performance as the Grammy’s support for the #MeToo movement moment, especially in light of Kesha’s back-and-forth legal battle with producer Dr. Luke over 2014 allegations he drugged, emotional abused, and sexually assaulted the 30-year-old. Unfortunately, despite the powerful performance and changing tide throughout the entertainment industry, Kesha lost out to Ed Sheeran’s “Shape of You” for Best Pop Solo Performance, leading to an outcry on social media. This year’s awards had a decidedly political bent, but it still came as a surprise when Hillary Clinton made a surprise cameo. Clinton joined John Legend, Cher, and Snoop Dogg in a sketch with host James Corden in which the former Democratic presidential candidate read an excerpt of the controversial “Fire and Fury” book in a mock audition for a spoken-word recording job. Just over a year after her tragic death, Carrie Fisher won her first Grammy last night. The actress won posthumously for Best Spoken Word Album for her recording of The Princess Diarist, her 2016 memoir which chronicled her time making the original Star Wars. Fisher’s win beat out Neil deGrasse Tyson, Shelly Peiken, Bruce Springsteen, Bernie Sanders and Mark Ruffalo. This was her second nomination in the category, having first been nominated in 2009 for Wishful Drinking. 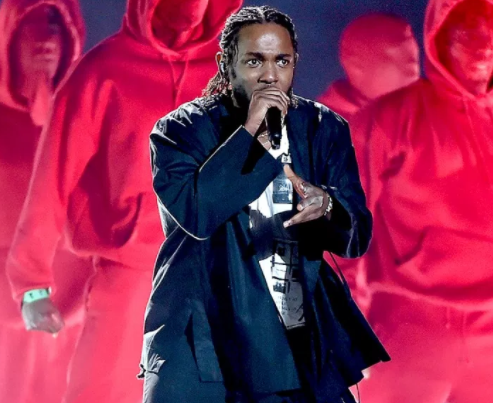 Kendrick Lamar’s opening performance of the Grammy Awards last night was a politically-charged statement maker, due in part to his dark and powerful performance of his track, “Damn,” in which he raps about a friend whose only son was murdered. The performance was backed by an image of the American flag with marchers in ski masks and military fatigues as he rapped, “‘Ain’t no Black Power when your baby killed by a coward.” The incredible, jaw-dropping performance made fans hopeful Lamar would win in two of the biggest categories at the Grammys — Best Album and Record of the Year, but it was not meant to be. Lamar lost out to the less political Bruno Mars, sending fans and critics to complain on Twitter that the awards not only are snubbing rap artists, but are tone deaf when it comes to the art form and its meaning. Not exactly a moment per se, but this years Grammys have had quite a bit of controversy, much of it stemming form some of the things we’ve noted. But while the awards are frequently criticized for being about rewarding commercial success instead of artistic achievement, this year audiences were vocal on social media about deeper issues, including sexism. Not only were fans upset about Kesha’s snub, there were those outspoken about Lorde’s decision not to perform at the ceremony. Lorde, the only female nominee for Album of the Year, declined to perform at the ceremony when the only performance option she was presented was to be part of a Tom Petty tribute, while the male nominees were all given their own, solo performance spots on the show. What were some of your favorite moments at the 2018 Grammy Awards? Share with us in the comments below. ← What Is the Right Age for Babies to Start Eating Solid Foods?